Last nigh I had a company: two of my friends came over for a chat. And some tea. And some sweets that I was going to make myself to impress them. Then the phone rang. I looked at the number and picked it up, thinking that may be one of the friends calling from work to check on directions or parking. - Hi, my name is L., I am calling from this organisation. You've applied for this position, can you come for an interview? - Awwmmm, would you, please, give me some more details? I've applied to probably hundreds of jobs. Then L. gave me some details and asked again if I am still interested and can come to the interview at 13.30. What? Today? 13:30? No, I can't come today, I have plans! Tomorrow would be good. Then L. apologetically tells me that they want to "squeeze" all interviews in today. Well, I was able to negotiate 11:30 instead, so I may still have time after to bake some cookies for my friends (I had my priorities, see?). I dropped everything I was doing in the kitchen, run upstairs to get myself ready: quick shower, makeup, dress? maybe not, pants would be more appropriate. Thirty minutes later I was in the car with my Interview folder (I keep in it a copy of resume, references, questions, paper, all that stuff) and my Kindle (you need to have some entertainment while you are waiting). I looked at the watch and realized that I may not be able to make any cookies before my friends come. I will have to make another trip to school to pick up the Teenager in about one hour. After a deep sigh I just drove to the local store and bought oatmeal cookies and some bite size pastry. And at home I would just make them some iced or hot tea. Knock on the door came just a few moments after I came home with the Teenager. Another sigh, relieved this time, that I made it. My friends were on the porch, smiling. We had a great time, laughing and giggling deep into the night. When they left, the Husband asked: "Do you want this butter on the counter?" Oops! I forgot all about my ingredients being ready for my baking show off. "No, I guess I am not baking today". Today I woke up still processing all yesterday happenings. It was a hectic but a good day. I felt sweet about it and needed a "sweet" treat for myself. I had a cup of coffee (not sweet), a rare treat as I don't drink coffee everyday anymore. I just have coffee when I really want it, about 2-3 times a month. I had an oatmeal cookie and a sweet pastry. 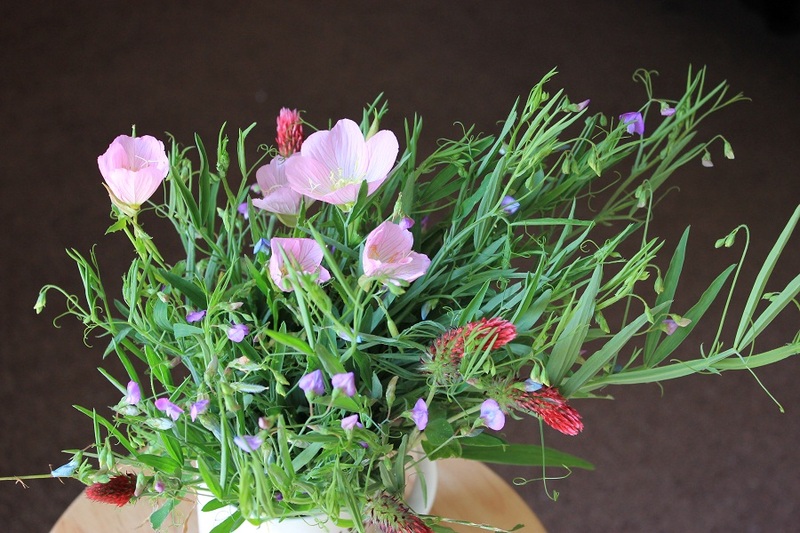 I also brought from my garden a bouquet of sweet peas that are in full bloom now. 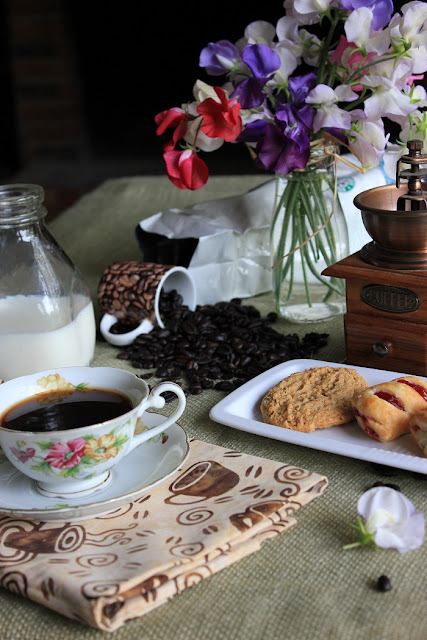 Sweet morning! And happy Friday to you! Thank you Heather! I think friends didn't even realize that I was going to bake something for them. Great time matters most, and we had it. What a day my dear friend. I hope that you get the job. and what a beuatiful flowers you got there. I also hope that you have the chance to impress your friends, I think next time will be more worthy all the hard work and the sweet ilusion. Thanks Walkiria. I hope I get that job too, I really need it! Good luck with the job, beautiful sweet peas arrangement. That sure was one hectic day, friends always understand. Thanks Norma! Sweet peas are from my garden, I planted another batch a few days ago. They are so beautiful and fragrant! Best of luck with getting the job (esp. if it's the one you want). 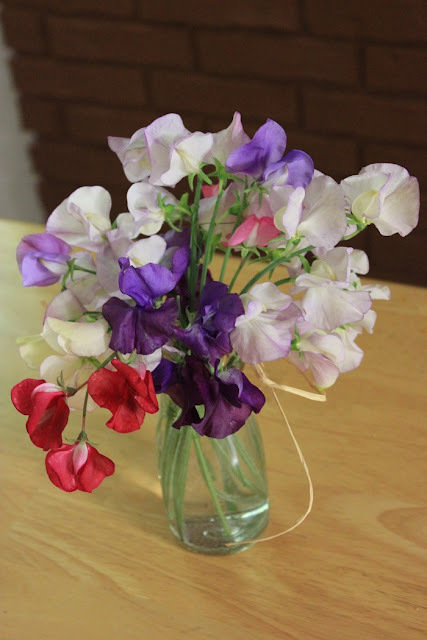 Your bouquet of sweet peas is adorable! Dear Milli, Thanks for visiting me here! I am so exited you love the photo! Love your photos - they are always so sunny and bright and great composition. Good luck with the job! Thank you and thank you! I am glad you liked my photos. It's my third(?) month since I started my photo adventure. One would think so, but you never know what's in their minds! We shell see in a week. Great post. While I was reading it, I almost forgot to breathe. I was wondering how you were going to make this all come together. Good luck with the job. You made me smile Sheila! Thanks for your kindness! Thanks Anna! I am pleased to meet you too! Oh I love sweet peas! What lovely pictures. Best of luck with the job hunting! This is such a nice photograph. A great way to start the day. All the best with the job. I really enjoyed reading your post. I actually visualized all that was happening as I kept reading. Yes, it really was a hectic day for you but I am glad you had a fun and relaxed time, at the end with your friends. The flowers are gorgeous! Your flowers are lovely! Is that an old milk bottle they're in? I love it! And friends don't care if it's homemade...they just come for your company! I hope you get the job if it's the one you want! Congratulations! Sometimes life gets in the way, and that is ok. Good luck on the job... I just think it is a little crazy that they called you for an interview, and you had to go right in! They must really need someone, and must like you!! Thank you Jane! Yes, I had the same thought about going right in the same day. We shell see next week when they make their decision. Such is life! Throwing unexpected stuff at us. Good luck with the job! The hard part is over, fingers crossed it is the good news after this. Thanks you! We had a very mild winter and a very warm spring, and sweet peas are blooming way ahead of the time.